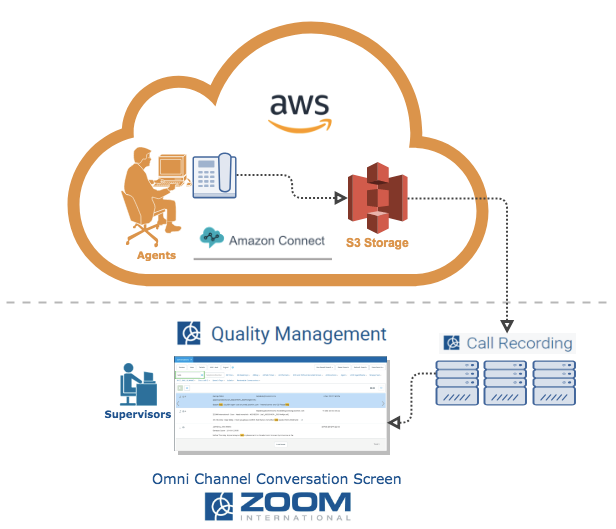 ZOOM's WFO suite integrates seamlessly with Amazon Connect to retrieve voice interactions and contact center metadata to drive insights into the customer experience. ZOOM retrieves recorded calls from S3 storage and presents them within our conversation application along with other omnichannel data, CRM data, contact center data and virtually any other data source in your organization. ZOOM connects directly to Amazon Connect's S3 storage using secure APIs to download call metadata and voice recordings. A single installation of ZOOM allows for multi-channel input of calls, emails, text, web chat or other interaction types in an easy to utilize application for contact centers. Contact centers looking for infrastructure cost savings are able to move all their WFO applications to the cloud. Contact centers in need of additional throughput for seasonal surges. Contact centers looking to consolidate their applications to a single cloud environment. Experience the innovation of a single view of the combined customer experience with ZOOM’s search-based conversation dashboard. Capture your customer’s loyalty with post call NPS®surveys and analyze results with quality scores using ZOOM dashboards. ZOOM’s contact center focused reporting and analytics help you make informed decisions and optimize your organization. ZOOM call recording is one critical element of many for capturing the experience of your customers. Our products comprehensively capture and collate interactions from your customers through multiple channels including voice, text, chat,& email into a single quality management system. ZOOM products go as step further, allowing for survey of customers to capture their experience directly from the source.